The DESI project is spearheaded by Lawrence Berkeley Lab in California and being installed at Kitt Peak in Arizona. However, it really represents a worldwide collaboration. There are scientists working on this project from England, France, Spain, Italy, South Korea, China, France, Canada, Colombia, Australia, and others plus numerous institutions within the United States. All of these agencies are not only contributing expertise, but actually building components that will go into the finished instrument. In an earlier post, I spoke about how we worked to remove the Mayall telescope’s original top end. The top end originally housed both a secondary mirror and a prime focus camera. Both of these have been used to make groundbreaking discoveries over the last five decades. 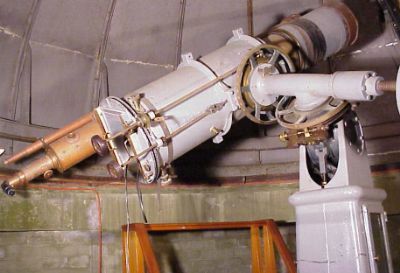 The Mayall was the telescope Vera Rubin used to study rotation curves of galaxies, which led to the discovery of dark matter. I’ve helped with observations that have led to the confirmation of numerous exoplanets. We’re now replacing the telescope’s original top end with a new one that will hold 5000 fibers at prime focus. Each of those fibers will run to spectrographs that will break up the light from objects in the sky so it may be analyzed and the position of the object can be measured. In the photo above, you can see the new top end being assembled to the left of the telescope. 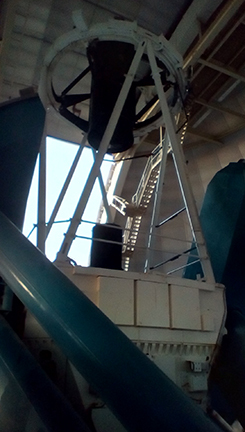 To get light from the sky onto the fibers, the telescope will collect it with the primary mirror. That sits in the big white structure at the center of the big blue horseshoe-like structure in the photo above. The mirror will direct that light to the top end. Because the mirror is curved, allowing the light to be collected and redirected, it means the focus changes across the field of view. To deal with that, you need to put some lenses in front of the fibers, sort of like glasses. Another real world problem of telescopes is that as you point toward the horizon, light gets spread out. So you need optics to compensate for where you’re pointing in the sky. Sort of like glasses that automatically adjust themselves for where you’re looking. Scientists from England assembled those specialized “glasses” for the telescope. Those arrived last week and I was on hand during their assembly at Kitt Peak. You see those assembled optics in the lower photo. Scientists from Italy built the “Hexapod” pointing system, which keeps those optics aligned. That arrived and was tested about a month ago. Scientists from Fermilab in Chicago are responsible for integrating those systems and putting them together in the top end ring. That process will start next week. It’s all quite a puzzle and it’s been remarkable to see it all come together. It’ll be even more amazing to see what science it yields. Last week, I talked a little about the work we’re doing refitting the Mayall 4-meter Telescope for the Dark Energy Spectrographic Instrument. However, it’s not the only construction going on at Kitt Peak. 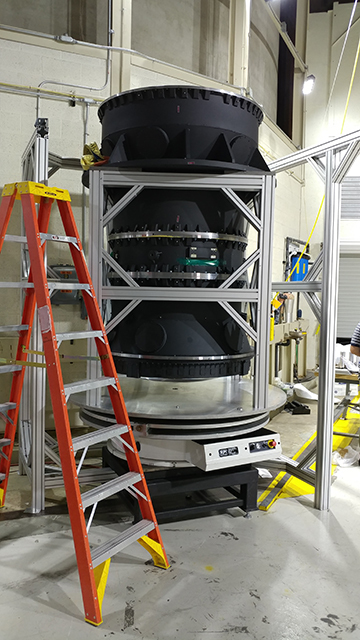 The WIYN 3.5-meter telescope, which I also work with, is getting a new spectrograph installed called NEID. Deploying NEID doesn’t require a full telescope refit like deploying DESI, but there’s still quite a bit of work happening in the building. Most of the work right now is going into building a new bench spectrograph room. NEID is an acronym for “NN-explore Exoplanet Investigations with Dopler spectroscopy”. The word “neid” is also the Tohono O’Odham word meaning “to see.” An appropriate choice, given Kitt Peak’s location on the Tohono O’Odham Nation in Southern Arizona. The goal of NEID is to provide the astronomical community with a state-of-the-art Doppler spectrograph to investigate exoplanets around nearby stars. The way this will work is that an optical fiber assembly will be mounted to the telescope itself at the port in the photo to the right with the sign on it. That optical fiber will carry the light from the star to the new bench spectrograph downstairs where it will be spread out, like a rainbow. The reason for doing this is not to see a pretty rainbow, but to see dark lines interspersed through the rainbow. Those dark lines are like the star’s chemical fingerprint. Now, here’s the fun part. When a planet moves around the star, it drags the star just a tiny amount toward the Earth which causes that spectral fingerprint to shift a little bit toward the blue end of the spectrum. When the planet passes behind the star, it drags it away from the Earth and moves the spectral fingerprint toward the red end of the spectrum. Looking for this shift is the “Doppler” approach to finding planets that NEID will employ. In addition to discovering new planets, NEID will be used to follow up observations by NASA’s Transiting Exoplanet Survey Satellite (TESS) and will help to determine masses and densities for planets TESS discovers. By the way, the NN-Explore that’s part of NEID’s acronym stands for NASA-NSF-EXoPLanet Observational REsearch. The current plan is to begin commissioning the instrument this fall and for regular observations to commence in 2019. Being part of on-going research into planets around other stars is what inspired Dr. Steve Howell of NASA’s Ames Spaceflight Center and I to invite science fiction writers to imagine what these planets around other stars might be like. The results were our two anthologies, A Kepler’s Dozen and Kepler’s Cowboys. You can learn more about the anthologies by clicking on their titles. Once NEID goes online and starts making discoveries, Steve and I may have to “see” into the future and collect a third anthology. This time, including stories about planets discovered by a telescope on a mountaintop in Arizona’s Tohono O’Odham Nation. I was in 8th grade when Star Trek: The Motion Picture came out. One of the things that fascinated me in that movie was the refit of the Starship Enterprise. I was captivated by how the ship looked at once much the same and yet completely different. It looked sleeker and more powerful and familiar space on the ship such as the bridge, sickbay, and the transporter room had all been updated. I’m getting to experience something much like the Enterprise refit in real life. 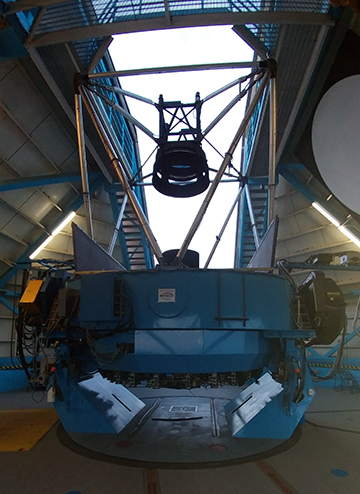 In this case, I’m involved in refitting the Mayall 4-meter telescope at Kitt Peak National Observatory. Like the Starship Enterprise, the Mayall has a forty-five year history of discovery. Originally built to use photographic plates, the telescope has played an important role in such discoveries as establishing the role of dark matter in the Universe from measurements of galaxy rotation, and determining the scale and structure of the Universe. Over the years, new instrumentation has been added to the telescope including advanced digital cameras and spectrographs. The purpose of the refit is to install a new instrument called DESI, which stands for Dark Energy Spectroscopic Instrument. 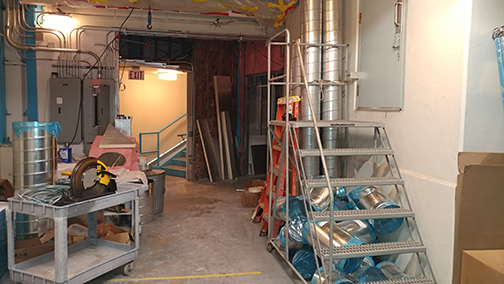 5000 optical fibers will be installed at the telescope’s prime focus (the top end of the telescope) and run to cameras in another room. The goal is to observe tens of millions of galaxies and quasars, constructing a three-dimensional map spanning the nearby universe to 10 billion light years. In order to achieve this goal, the entire top end of the telescope has to be replaced and much of the control software and electronics are being redone so that it’s truly state of the art. To achieve this goal, we literally have to gut the telescope and install new components from the inside out. During my most recent shifts at the telescope, I’ve been involved in just that. In the photo to the right, you can see that the bottom of the telescope is missing and replaced with scaffolding. That’s because the large 4-meter mirror is out for recoating. Also, all the optics are missing from the secondary mirror assembly at the top of the telescope. Ultimately, that will be removed completely and replaced with a new secondary ring. 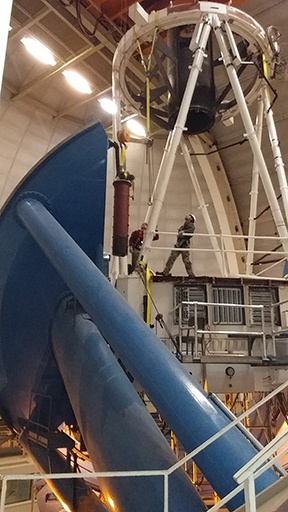 The men in the photo are removing a counterweight assembly used to precisely balance the telescope when instruments are added and removed. Electrical panels are open on the side of the telescope where control cabling going back to the photographic days will be removed and replaced with new control cabling. Modern electronics mean the telescope will have about 10% of the cables as it did when originally built! The refit has also allowed me a rare opportunity to see parts of the telescope I’ve never been to before, even after operating it for some thirteen years. Earlier this week I got to help the electronics technicians work on some cabling in the “horseshoe.” That’s the big, blue horseshoe-shaped mount you see in the photos above. We actually ended up working down in the broad, blue, oval-shaped tube you see in the photo just above. I dubbed it the sinking submarine, because it’s a cramped space and we were standing at a 32-degree angle relative to the ground! It’s going to be exciting to watch the telescope take shape again after the teardown process. New parts will be arriving in the coming months. A large crane will be deployed outside the 4-meter to lift out the old secondary ring and bring in the new one. The plan is to be back on sky to test components of the new instrument later this year. Once those tests are completed, other components will be finished, revised if needed and then installed. At that point, the Mayall’s new five-year mission to map the universe will begin. The first stirrings of what would become my interest in steampunk happened the year K.W. Jeter coined the word in a letter to Locus Magazine. During the summer of 1987, I worked at Maria Mitchell Observatory on Nantucket, observing pulsating variable stars with an early twentieth-century telescope driven by a wind-up clock drive. I would go on to publish those results and present them at Harvard College Observatory. The idea that I could explore the universe with equipment built in the Victorian era stuck with me through the years and eventually blossomed when I started writing steampunk and weird western stories. When I started attending steampunk events about five years ago, the maker culture reminded me of my introduction to astronomy. A few years before I worked at Maria Mitchell Observatory, I joined an amateur astronomy club and was encouraged to build a Dobsonian telescopes. Designed by amateur astronomer John Dobson, these inexpensive, easy-to-build telescopes allow anyone with an interest to look at planets, stars, and beyond. This history combined with some extra motivation from one of my daughter’s science projects, led us to build a little steampunk Dobsonian telescope. The telescope’s tube is, in fact, cardboard, but I gave it a coat of brass paint as a tribute to the Alvan Clarke and Sons telescopes I worked with on Nantucket and which drove so much science through the Victorian era. Having built this telescope, we have since taken it to steampunk and science fiction conventions where we’ve viewed planets and nebulae. 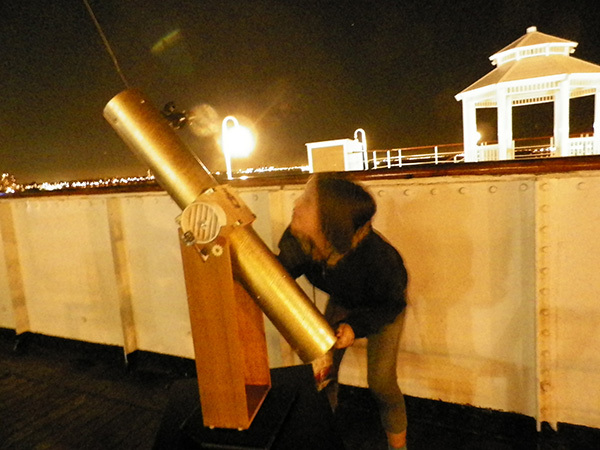 Here’s my daughter setting up the telescope on the deck of the Queen Mary at Her Royal Majesty’s Steampunk Symposium in 2015. I’ve also conducted workshops, using the steampunk telescope as an example of how easy and satisfying it is to build your own small telescope. It’s exciting when people look through a telescope like this and realize they can peer into moon craters, see the rings of Saturn, or the ghostly Orion Nebula. For them, science has left the textbook and become something they can access. There’s even more magic when people realize they can get those kinds of views with something they built themselves. If you’re interested in building a telescope like this for your own enjoyment, I wrote two posts that should help you get started and include links to more detailed information. This post is part of Steampunk Hands Around the World. Visit the Airship Ambassador for more information and to visit more great posts on the topic! No one can predict the weather. That’s even true for world-class astronomers and astrophysicists. 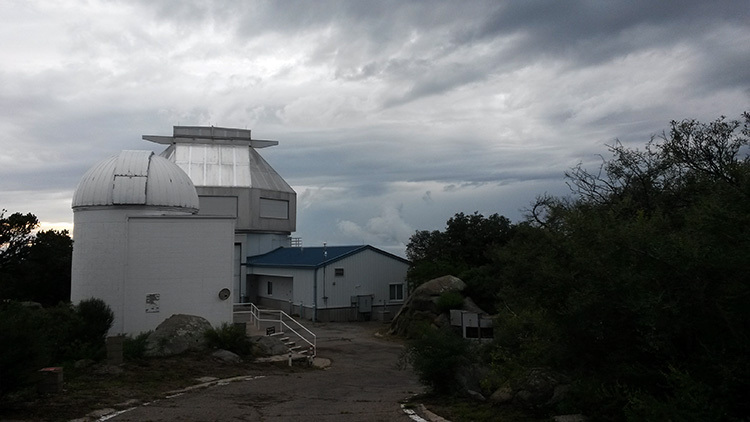 As a result, the world’s premier facilities for collecting astronomical data, such as Kitt Peak National Observatory, are staffed year-round regardless of weekdays or holidays, so that we can take advantage of clear, stable skies whenever they occur. The only exception the observatory makes most years is Christmas and Christmas Eve. This year, one of my shifts happens to fall over Labor Day Weekend. Unfortunately, Tropical Storm Kevin off the coast of Baja California is also pumping lots of moisture up here, so we’re spending some of our time waiting, watching and hoping the skies will clear. Of course, even with clouds, it’s not all waiting around, doing nothing until the skies clear. 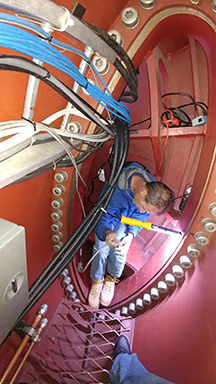 Over the course of the summer monsoon shutdown, a new Telescope Control System was installed at the Mayall 4-meter telescope. 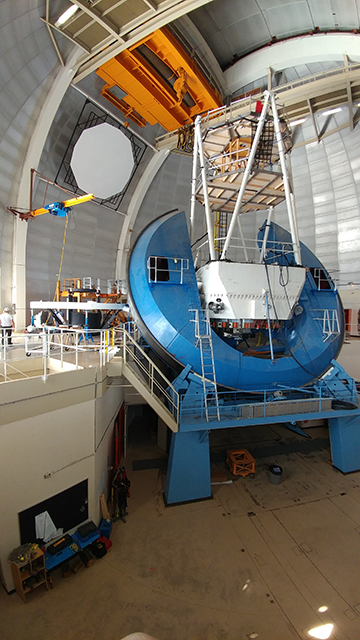 All indications are this new control system had made great improvements in the pointing and tracking performance of a 45-year old telescope, getting it ready for a new world-class spectrograph that will be installed over the coming years. Still, it means I get to learn how to drive the telescope all over again, and it’s best if I do that on these cloudy nights so I’m ready to go when the skies clear and astronomers go hunting those photons that may have taken thousands, millions, or even billions of years to reach us. Keeping busy right now is good, since my editor dropped me a note at the beginning of the week, saying that she’s started editing my horror novel, The Astronomer’s Crypt. So now I’m at that nail-biting stage of wondering which scenes she’ll like and which ones she’ll want rewritten. Her note mentioned that I better not give her nightmares. I can’t help but wonder if my horror novel fails to give her nightmares will I have have succeeded or failed! Seriously, though, these dark and stormy nights that we’re having at the observatory right now are not a little like the one described in the novel. Stay tuned for more news! 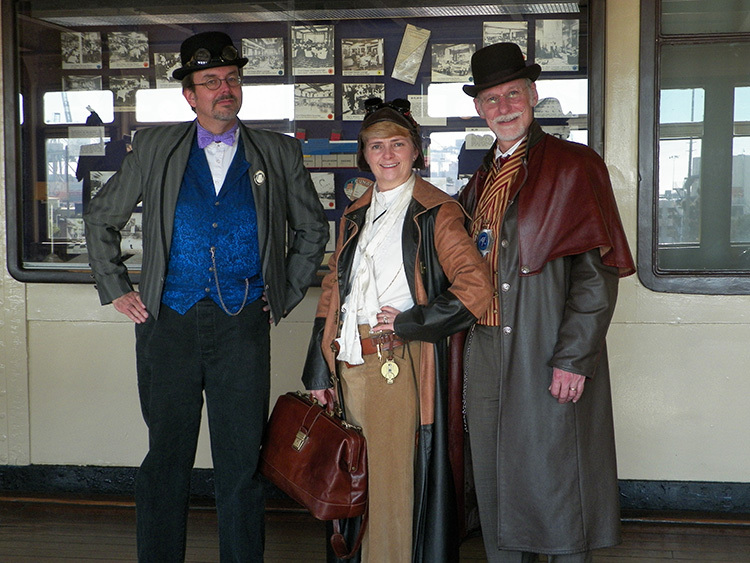 I spent last weekend aboard the Queen Mary docked at Long Beach, California for the 2015 edition of Her Royal Majesty’s Steampunk Symposium. We kicked things off by listening to the radio show edition of London, Where It All Began by David L. Drake and Katherine L. Morse on the drive over. The authors attended the symposium in their Drake and McTrowell personae, and their stories are a delight. 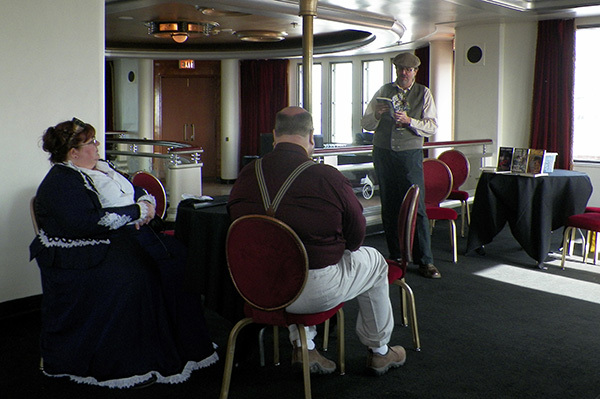 Once we arrived at the Queen Mary, I made a quick change and went right to my first event, where I read the first chapter of my latest novel, Lightning Wolves. Although it was early in the convention, some brave souls arrived and took in the story. After the reading, I attended a presentation on Victorian-era Voodoo in New Orleans by my friend Denise Dumars. 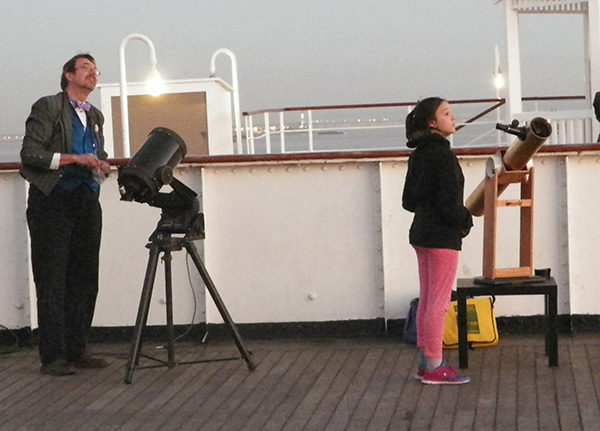 As day gave way to night, we set up two telescopes on the sun deck of the Queen Mary in hopes of viewing the Orion Nebula, Jupiter, and any other objects we could find through the bright lights and sea air of Long Beach. 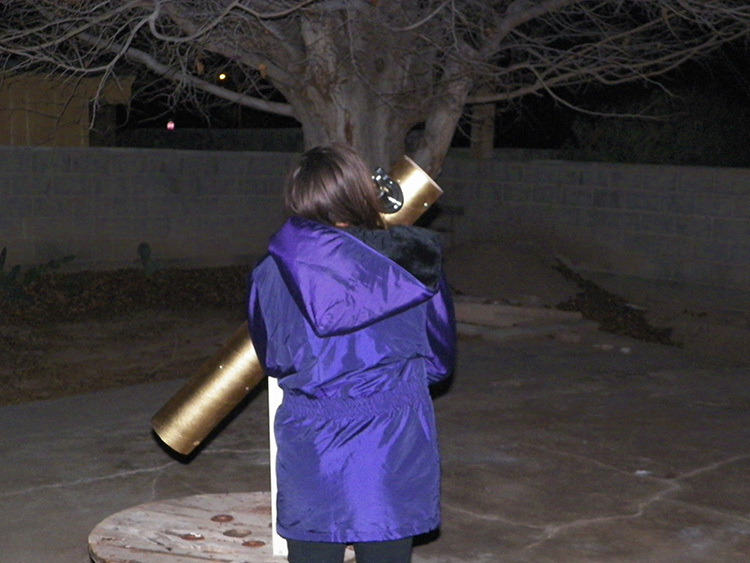 The little steampunk telescope I described last week proved to be a success. It was easy to use and we found objects right away. My 8-inch Celestron which I’ve had for thirty years proved a bit more challenging, but I finally figured out I mis-read the label on the eyepiece I selected and it was both one difficult to use with all the lights around and a narrower field of view than I thought. I moved to a wider field-of-view Plössl eyepiece and things went much more smoothly. I rounded out the night by attending a magic show by the talented Aiden Sinclair. This show took the form of a séance to summon Jack the Ripper. Of course, Aiden is an illusionist and doesn’t claim to actually summon ghosts, but this was a small intimate group and we got to watch his work in detail. It was a wonderful show and I also had a chance to visit with friends such as Drake and McTrowell, long into the night. The next day came much too soon. Kumie and I awoke and took books up to our merch table outside the dealer’s room, where we were delighted to spend the day next to Nathaniel Johnstone and Laura Tempest Zakroff’s table on one side and Gaslight Gathering’s table on the other. We had a wonderful day chatting with readers and other steampunks. That afternoon, I presented my “Mars, Across the Aether” talk where I told a tale of the red planet, its canals, Queen Victoria’s watercolor teacher and extraterrestrial signals detected by Nicola Tesla. Afterwards, we returned to the deck to set up the telescopes. Here you see me working alongside my youngest daughter. Sunday morning saw a return to the merch table for a short time. 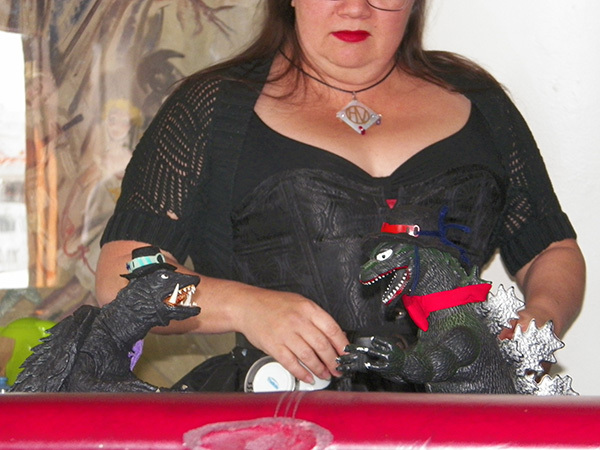 Early in the afternoon, I promised to serve as second for Steampunk Gamera in a grudge match tea duel against Steampunk Godzilla. For those unfamiliar with tea dueling, it is a competition which allows two people (or monsters) to settle their differences with a show of manners and decorum rather than through the use of arms. Girded with a cookie and cup of tea, the opponents each dunk their cookie into the tea for a five count. Once raised, the last one to eat their cookie without it crumbling is the winner. In the Gamera vrs. Godzilla tea duel, the seconds had to take the field as shown here. Godzilla’s second is the delightful Madame Askew. 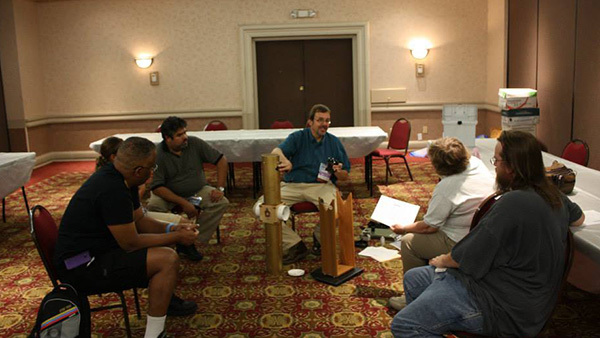 After the tea dueling, I gave a presentation on building the steampunk telescope. Sadly, because of the long drive back to New Mexico, we then had to pack up and leave immediately afterward. The weekend was a delightful blur, but I hope to make it back again next year. My next convention will also be a foray back to the age of steam, Wild Wild West Con in Tucson, Arizona. Stay tuned for more details! Back in November, I wrote a post that discussed building a telescope. The telescope worked great. The only problem was that without a mount, it was hard to point and keep the telescope on a target. This made it hard for multiple people to enjoy the view, or even for one person to look for more than a few seconds. To kick off this year, I built a simple mount for the telescope and this weekend, at Her Royal Majesty’s Steampunk Symposium in Long Beach, California, I’ll be hosting viewings through the telescope and showing people how they can build one just like it. 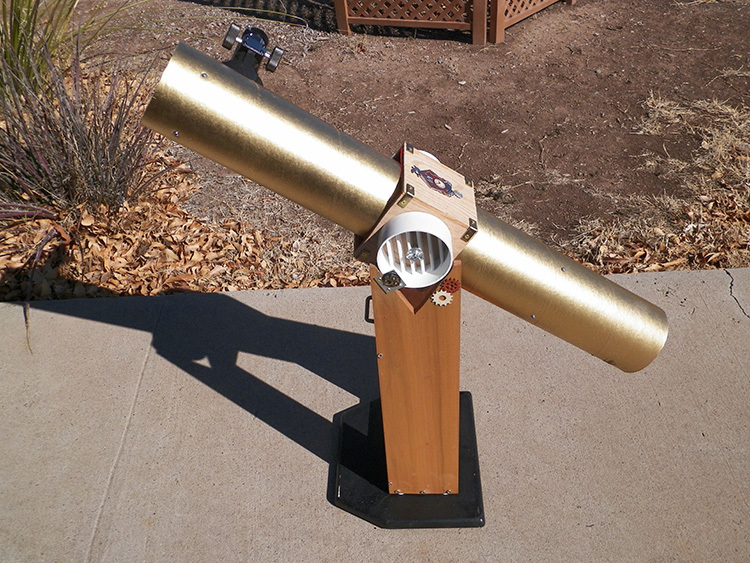 The mount I built is basically a variation of one described at the 10-minute Astronomy Blog. Because my telescope is in a cardboard tube, I built a wooden box that fit snugly around the tube to hold the altitude bearings. Like the mount described in the 10-minute Astronomy Blog, my bearings are simply grated PVC end caps. I lined the wooden box with felt to snug the fit a bit more and avoid damaging the tube as I slid it in place. Allowing the altitude bearing box to be a pressure fit allows me to rotate the tube inside and it allows me to adjust the position of the telescope if I should add weight to one end or the other. Another variation is that instead of building the ground board from scratch, my wife found a rotating TV stand at a thrift store for 99 cents. I simply put rubber feet on the bottom of my rocker box and set it on the TV stand. Finally, I found that my elevation axis had a tendency to slip sideways, causing the telescope to slip out of the V-cuts. I solved this by adding melding plates to the outside of the V-cuts that keep the telescope from slipping sideways. I could possibly have also prevented this problem by making my rocker box a little narrower. So, what makes this a “steampunk” telescope? First of all, it’s a Newtonian telescope very similar in design to the one Nathaniel Green, painting instructor to Queen Victoria, used to observe Mars in 1877. I painted the tube with brass spray paint to give it that old-fashioned brass tube look of nineteenth century telescope. Although it gets dangerously close to the song “Just Glue Some Gears On It (And Call It Steampunk)”, I did glue some gears on my Dobsonian mount. I tried to evoke the idea of the clockworks that were used to drive old telescopes. What’s more, they make the melding plates looks more decorative than purely functional. I also added a steampunk cuckoo clock decal to the top of the mount. After all, time is very important to astronomy! In a sense, the sky’s the limit—literally! The cardboard tube and simple wooden mount allow you decorate your telescope in a myriad of splendid ways, so you can go stargazing in style! My only recommendation would be to keep lights to a minimum to keep your telescope functional. The stand and telescope are lightweight and easily transportable, making them good for taking out any time you want. And really, that’s the point of having a little telescope like this, so everyone can enjoy the wonders the sky has to offer.